Gun eTools: Detail View Update and feature description. Detail View Update and feature description. Some updates to the Gun Spot detail view. The color of the font is now in accordance with Apple's chosen standard color. Looks nice. The email icon in the top right hand corner is consistent with the Apple icon's. 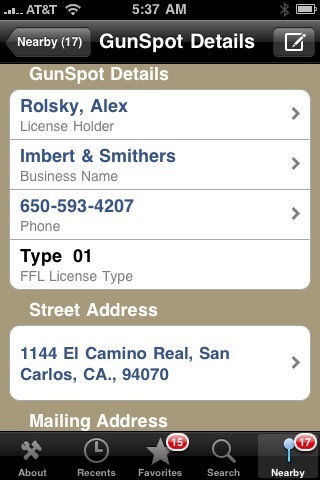 The License holder name and Business name both go to the web for more information but you stay in the app. This is for quick verification of web site etc. The phone number dials out. The address takes you to Google maps which presents you with a birds eye view of the place of business. From there you can get driving directions if so desired. That way you can tell if it's a kitchen table FFL or a business store front or just interested in looking at it from the air. All-in-all, it's pretty cool! Rest of the screen when scrolled down a little. 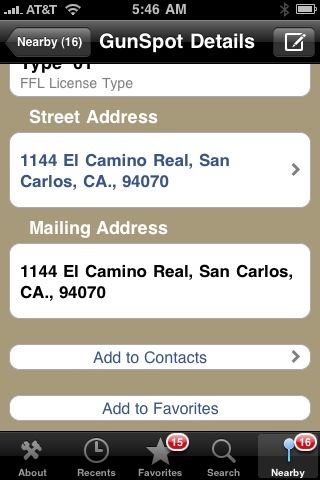 Here's the rest of the detail view... Mailing address is provided just because it's part of the data from the ATF. You can instantly add any Gun Spot to your contact info and then from there add more notes, phone numbers etc. You can add any Gun Spot to your favorites too.